In World of tanks battles is where all the action takes place. Be them Standard battles, Training battles or company battles. To enter a battle all a player needs to do is click the big red "battle" button on the top of the Garage UI and he will enter the queue for a standard battle. In order to change the type of battle a player wants to join simply click the drop down menu below the big "battle" button and select which type of battle you wish to play. Standard Battle: This is the most common type of battle around and the one selected by default, clicking it will take you to the battle queue were you will wait until a suitable number of opponents is found, this is usually a quick process. After the matchmaking is done everyone will load a map picked at random and the battle will start. In 0.7.4, two new game modes were added: Encounter and Assault. These are chosen randomly, however after the 0.8.0 patch the player has a choice to exclude certain types of battles. Create Platoon: This button allows you to create a platoon. Standard accounts may form a platoon of up to 2 players. Premium accounts can create a platoon with up to 3 players. Both premium and standard accounts can be invited into any platoon. Platoons are groups of up to 3 players that can jump into standard battles together. This is particularly useful if you want to play with your friends or want to have some people that you know will work with you during the battle. During the initial loading screen for a match players that are part of platoons will have a small numbered shield identifying which platoon they are a part of for everyone to see. Training battles: This button takes the player to the training match lobby, there he can see what training matches are currently taking place and can create his own training room. In a training battle the players can pick which map they want to play and can also change the battle time from the standard 15 minutes to something else. After a player joins a training battle lobby he must be moved into one of the teams by the player that created the training room. No credits or experience are awarded in training battles, repairs are free but ammo and consumables are expended and must be paid in full for restocking. Tank Companies: This button allows the player to create a Tank company (only premium accounts can create a company, however both premium and standard accounts can be invited/join one). In company battles players need to create a team up to 15 members that weights between 70 and 90 points (this value is calculated by summing up the tiers of all the tanks in the team) then they will fight against other companies. Company battles wont start until there are at least 4 teams in the queue, XP and credits are awarded as usual. After a player enters a battle there is a brief period of time where nothing happens waiting for a certain number of players to load, after that a 30 second countdown timer starts and after that the battle starts. Battles last for 15 minutes and end when all tanks in one of the teams are destroyed, when one of the teams captures the enemy base or when the 15 minute timer expires. In a win the winning team gets a bonus of 50% experience and credits, in draws and losses there are no bonuses. Pressing alt during a battle will bring up basic information about teammates above their tanks (name, HP left), pressing tab will bring up a scoreboard. You many never join a battle in a tank that is not fully repaired, you can however join a battle with no ammo after passing a "are you sure" box. Please study the image below. 1: This area will display quick information about your system performance and connection performance. giving you quick information about your Frames per second, your ping and your lag. 2: This is the overall scoreboard, it displays how many kills each team scored. In the event of a draw this is not used to determine the victor and serves merely for statistical purposes. 3: Base capture indicators, in here progress bars indicating the capture status of each base will display. Enemy base capture will display in green while if your base is being captured it will display as red. 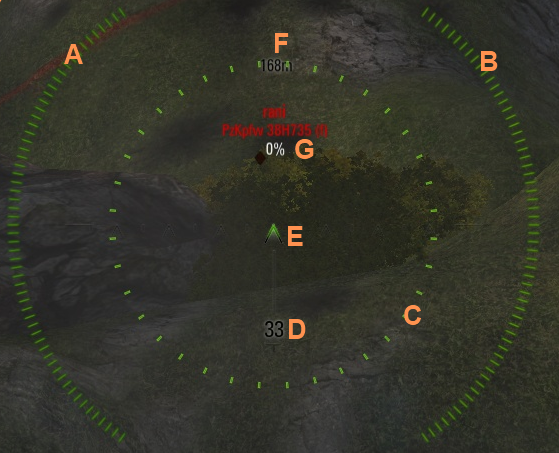 In order to capture a base players need to stand inside the white lined circle at the enemy base, dealing damage to a tank capturing a base will reset the counter (only applies to the amount of cap points that tank was contributing). 4: The clock, this countdown clock will keep tabs on how much time there is left to fight. It will turn red in the last minute of the battle. 5: The enemy team roster, this area will display the enemy team tanks, as well as their kills and status (destroyed or in battle) Tanks are ordered by status, then inside each status by tier and finally inside each tier alphabetically ordered. 6: Your team roster, this area will display your team tanks, as well as their kills and status (destroyed or in battle) Tanks are ordered by status, then inside each status by tier and finally inside each tier alphabetically ordered. Note that due to character limitations the full name of a player might not display in this view, if you wish to get a full player name use tab, this also applies to the enemy team. You pointer. This section is probably the part of the battle UI that you will spend the most time looking at, it also is highly customizable via the already covered in this tutorial Reticle tab in the Settings. A: This is the ammunition load indicator, when a shot is fired it will reset and start growing again as the shell loads. Once it is fully green and filled again your tank has reloaded. B: This is the tank health points indicator, it will start full and green and will turn red passing by yellow as your tank loses HP during the battle. C: This is the shell spread indicator, if you fire chances are your shell will hit inside this area, it is already corrected for gravity drop and Coriolis effect. This area will enlarge and shrink based on the position of your tank, a stationary tank will have a far greater accuracy than a moving tank. 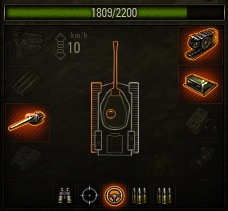 The color of this indicator can be customized to reflect any status of the tank, from reload status to Hp left. D: This is your ammo count for the currently selected ammo type. E: This section is actually two different indicators, one is a small bare customizable pointer that is simply there to indicate the center of your screen when you look at something, and the other is the gun barrel indicator, that can too be customized (to display for example a rough estimate of penetration change on the enemy tank) but it is very important to note that the gun barrel indicator will always follow your mid screen pointer. This is important because your traverse speed will fot en be slower than the speed you will be looking around. It is also important to note that moving your turret decreases your accuracy. F: The distance to the target you are currently aiming at. G: Some quick to read information about the target you are currently aiming at. 8: The battle events indicator, enemy tanks being destroyed will display as Green, friendly tanks being destroyed will display as red, your kills will display as dark yellow. 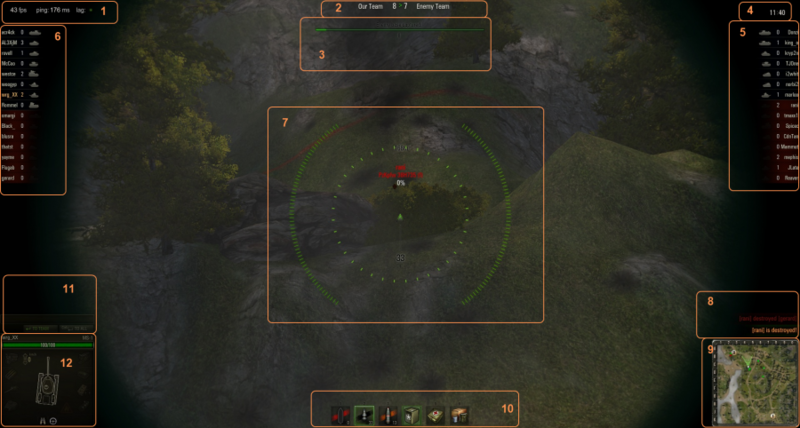 9: The mini-map, green dots are your friendly tanks and the red dots are enemy tanks, what you see in the mini-map is directly influenced by your and your teammate's radio range. Pressing control and left clicking on a grid in the mini-map will ping that grid for all of your teammates to see. If you are playing artillery pressing control and right clicking the mini map will bring you to strategic view over the clicked area. 10: Your ammo and consumables, clicking the corresponding number will use the corresponding consumable. For ammo one click will queue that ammo type to be loaded next while a double click will immediatly load that ammo type. 11: The chat area, friendly nicknames will show as green, opponent nicknames will show as red and your own nickname will show as dark yellow. Messages sent to only your team will be green while messages sent to everyone will be white. In order to open the chat box press enter. You can then switch chat mode between team, all and platoon with the tab key. Alternatively, you can press ctrl+enter to start the chat in 'all' mode, and shift+enter to start it in 'platoon' mode. 12: Tank status area, here you will have all the information regarding your tank. Your nickname and tank type will also display. In here you can quickly see your tank's HP, your internal modules damage, your crew injuries and the angle betwen your tank front and your gun barrel. Also you can easily check what is your current speed. (TIP, to move forward or backwards at a constant speed you can use the 3 forward and 2 backwards gears by pressing "R" for forward and "F" for backward). Engine: Your tank engine, if it is damaged your tank will move 50% slower. Ammo: Your tank ammo, if it is damaged you will reload 50% slower, also your ammo can explode when it is hit generally causing further damage or even destruction of your tank. Gun: Your tank gun, if it is damaged you will have 50% less accuracy. Turret: Your tank turret, if it is damaged it will traverse 50% slower. Please remember that most Tank Destroyers and SPG's do not have turrets. Tracks (suspension): These are actually 2 independent modules, left and right suspensions. They are totally independent when it comes to damage. If they are damaged your tank will traverse slower. View port: Your tank's view port, if it is damaged you will have 50% less view range and will have a bigger difficulty spotting targets behind bushes and such. Radio: Your radio, if it is damaged you will have 50% less radio range. Fuel Tank: Your fuel tank, if it is damaged you will have 50% more chance of catching on fire when hit and will last for longer. Fires can damage other components within the tank. When a module is destroyed it will slowly recover and at some point will become only damaged and can be used again, obviously the damaged penalties apply. A high repair skill will allow for faster repairs. This is developed further down in the tutorial.